Lewis Carroll’s "Alice's Adventures in Wonderland" is a children’s classic which many of you will have read. Here I have put an excerpt from Chapter One (both the English original and the authorised German translation by Antonie Zimmerman) through this free online translator. See what you make of the results. TIP! : These texts are taken from the Gutenberg Project (www.gutenberg.org), the first and largest distributor of eBooks, and are copyright free. The Gutenberg Project is also one of my recommended sources of free German translations for German translation students, providing copyright-free English and German versions of classic texts. So she was considering in her own mind (as well as she could, for the hot day made her feel very sleepy and stupid), whether the pleasure of making a daisy-chain would be worth the trouble of getting up and picking the daisies, when suddenly a White Rabbit with pink eyes ran close by her." BABEL FISH: Down into the building of rabbits. And which books are useful, “thought Alice,” without pictures and discussions? “ It considered itself evenly, (so well it went, because it was sleepy and stupid from the heat,) whether it was worth to the trouble to rise and Gänseblümchen pick, in order to make a chain thereby, when suddenly a white rabbit with red eyes by-ran closely at it." Your first reaction to this translation may be "Oh dear", but - as a professional German translator - I still find it amazing that a computer programme can come up with an English translation of a German text at all! The Babelfish free translator has produced a gist translation - I get a good idea of what the text is about, giving me a basis upon which I can decide what to do next. Considering that this is a literary text (a translation specialisation in itself) and written over 100 years ago, I would expect no more from a machine translation. AUTHORIZED TRANSLATION: Hinunter in den Kaninchenbau. Sie überlegte sich eben, (so gut es ging, denn sie war schläfrig und dumm von der Hitze,) ob es der Mühe wert sei aufzustehen und Gänseblümchen zu pflücken, um eine Kette damit zu machen, als plötzlich ein weißes Kaninchen mit roten Augen dicht an ihr vorbeirannte." So betrachtete sie in ihrem eigenen Verstand (sowie könnte sie, denn der heiße Tag bildete ihr Gefühl sehr schläfrig und dumm), ob das Vergnügen der Herstellung einer Verkettung die Mühe des Aufstehens und der Ernte der Gänseblümchen wert sein würde, als plötzlich ein weißes Kaninchen mit rosafarbenen Augen nah durch sie lief." In both cases you can understand the overall subject matter but these translations wouldn't pass any exams! These examples primarily show that the greatest limitation of a free online translator is the inability to appreciate context. For example, in the German text we translated into English, the Babel Fish translator has misread the first sentence. It assumes that “fing” is the simple past (preterite) of the German verb “fangen” (to catch). However, it should have realized that the verb being used was “anfangen” (to start). As a result, the first sentence - (“Alice caught actually to bore”) - is nonsense. The Babel Fish translator accepts this but a human translator would have realized it was nonsense, and gone back to see where they’d gone wrong. “Alice was beginning to get very tired of”. At the risk of sounding school-marmey, if you'd like to know more about what makes a German translation good then check this out. I think these translations show just how subtle and complex language can be. Translation programmes will continue to improve and become increasingly useful, but I don't believe that they will ever match the beauty and coherence of a well thought out translation. TIP! 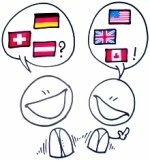 : If you only want to translate a few words then you might well be better off with a free online German dictionary which will give you more detailed information and a variety of alternative translations, according to context.